Figure A94. Zagros anomaly, interpreted as the Zagros slab, with (horizontal) [vertical] cross sections through (A)[D] the UUP07 p-wave) and (B)[D] the combined SL2013 and S40RTS s-wave models at 610 km; C) the location of the modern geological record that we interpret to have formed during the subduction of the slab. 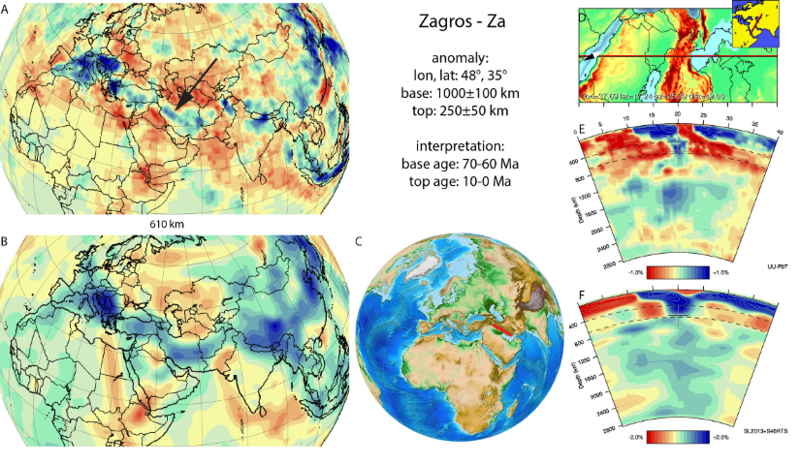 A northward dipping anomaly is located below the Zagros mountains of Iran in the upper mantle and in the upper part of the lower mantle (Hafkenscheid et al., 2006; Zor, 2008; Chang et al., 2010; Agard et al., 2011; Koulakov, 2011) (Figure A94). The anomaly is interpreted as the Zagros slab, disconnected from the deeper Mesopotamia slab by a gap that likely corresponds to a phase of slab break-off. Along most of the Zagros mountain range, the Zagros slab is no longer connected to the surface, and displays a clear gap suggesting a recent phase of slab break-off. Agard et al. (2011) suggested, based on the age of rapid exhumation of HP-LT metamorphic rocks found in the Zagros suture zone that there may have been a phase of slab break-off in the latest Cretaceous to Paleogene, ~65±5 Ma. We inferred that this corresponds to the age of the top of the Mesopotamia slab, and we also use this age as the maximum age of subduction of the base of the Zagros slab. The most recent phase of slab break-off occurred in the last ~10 Myr (Agard et al., 2011), which we adopt for the age of the top of the slab. Please see the comment on the related Mesopotamia slab. The thread of the proposal presented there is that the Mesopotamia slab was more likely to have broken off during the Eocene (~45-40 Ma), not the latest Cretaceous (~65 Ma) for reasons presented there and in Deevsalar et al. 2018 (JGSL 175, 915-933). The knock-on implication is that the base age of the Zagros slab should be 45-40 Ma, and that the slab segment represents only a maximum of 30 or so million years of subduction until the latest break-off probably in the late Cenozoic (Miocene), assuming this is geodynamically feasible.